There are two famous places to see Orang Utan in Indonesia, one is Tanjung Putting National Park, Central Kalimantan and the other one is Bukit Lawang, part of Gunung Leuser National Park, on the border of North Sumatera and Aceh Province. The experience of visiting Orang Utans at these two sites is a bit different. 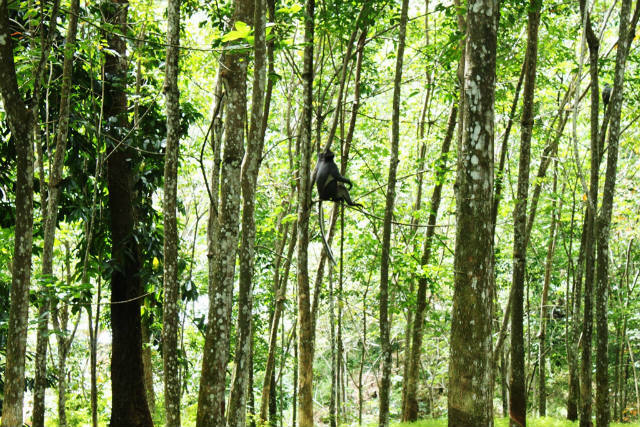 While Tanjung Putting is famous for Orang Utan conservation, Bukit Lawang is more famous for seeing Orang Utan (Pongo pygmaeus abelii) in their natural habitat. 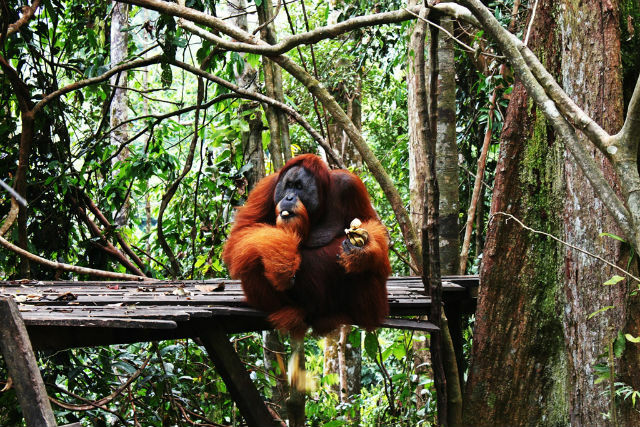 Besides, Bukit Lawang is also a place for Orang Utan rehabilitation. 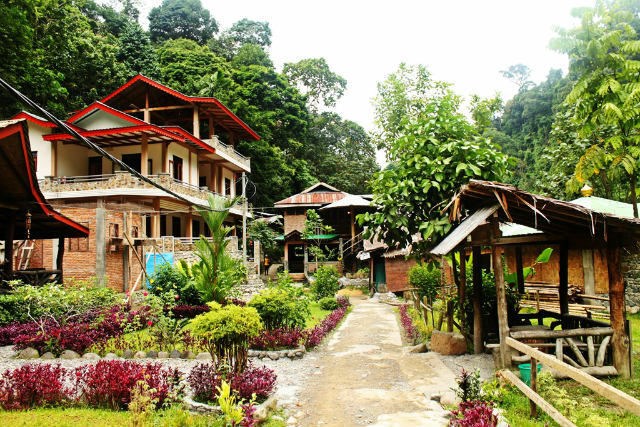 Bukit Lawang is located 90 km from Medan–capital of North Sumatera. It’s easy to access by public transportation – about a 3 hour trip – from the heart of Medan. I arrived in Bukit Lawang terminal by bus from Pinang Baris terminal in Medan, then continued by bentor (local call for motorbike taxi) to Bukit Lawang village—a small village where most of the lodges are established. I searched information for a guide; I heard it was quite expensive to hire a guide, but you don’t have choices. It is mandatory to use a guide for jungle trekking. I talked to a local guy who introduced me to Akim, a young local boy around 25 years old. He has many experiences guiding people from all around the world. We negotiated a lot; he requested I pay Rp.350.000 per person for a jungle trek and river tubing. Later, we had a deal for Rp.400.000 for two-person for half-day trekking, I assumed he agreed because it was low season. Our trek started from outer edge of Bukit Lawang village, across a hanging bridge over Bohorok River. He told me that back in 2003, there was heavy flooding here that really damaged Bukit Lawang village. First fauna we found is Thomas Leaf Monkey. This type of monkey is easy to spot because of its stylish hair, spike! There was not only one Thomas Leaf Monkey, but many of them hopping from one tree to another as they watched us coming. Rule number one; if you go to Bukit Lawang, do not expect to meet Orang Utan during your jungle trekking. Many people see Orang Utans here while their trekking, but many people don’t. It is the jungle after all and they live here freely. The good news is, you still can see Orang Utan at feeding time, twice a day, at 9 am and 3 pm. We were almost desperate. We had already been trekking for two hours, but couldn’t find any Orang Utans. Akim was trying hard to find any trace of Orang Utans. THEN WE FOUND ONE. We found a female Orang Utan not so far from us, on a tree. Not far from her there was a smaller Orang Utan that we were sure was her kid. Later, we found many of them hanging nicely on trees watching us suspiciously. Do not feed the Orang Utans! some of the guides give their guest bananas to feed the Orang Utans. 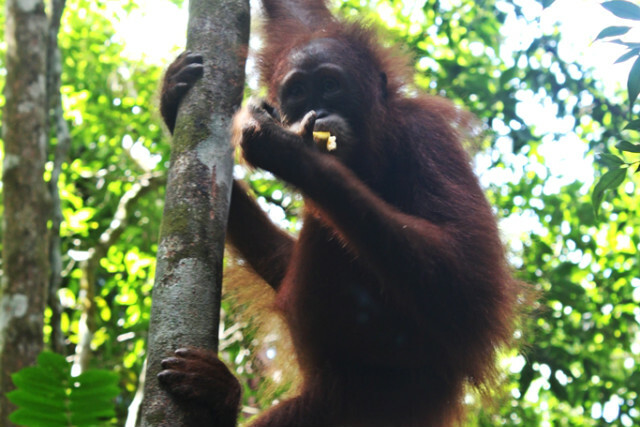 However, Orang Utans are easily sick and can get stomach aches when eating food that’s not part of their usual diet. Also, do not get too close to the Orang Utans. They might look tame, but they are strong and have sharp teeth. My guide, Akim warned me to stay at least seven meters away from Orang Utans at all times. Ucok, which is the name of one of the most famous Orang Utans, visited the feeding station while we were there. He swung easily from tree to tree. He did however break a huge branch on the way ;). On the return trip to the home stay, we went river-tubing. 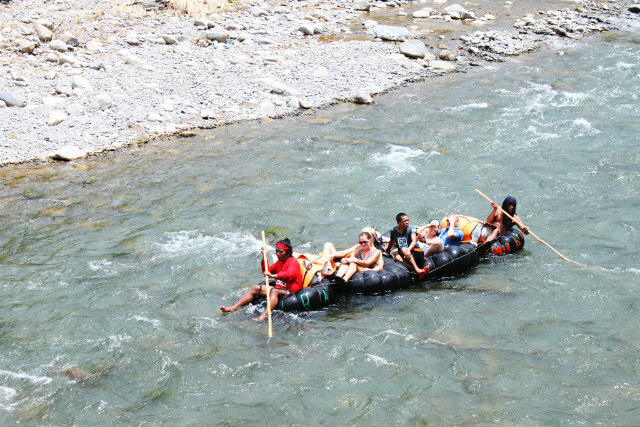 River-tubing is traditionally rafting using the big inner tube of truck/bus tires. They tied 3 or 4 tubes together to become one and then used a stick to control the movement. The river-tubing was great fun and one things for sure, your clothes will be wet! 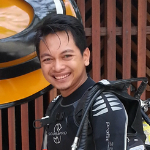 Muhamad Taufiq Hidayat or Fiqy, works while traveling and travels when working. Nature and also wildlife are his biggest interest. For him, having good companion while traveling is good, but doing solo travel is better. Check his stories at pelancongatlas and follow him on twitter & instagram.